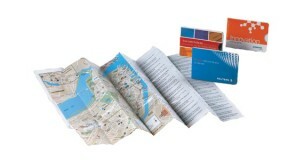 Who-what-where-when - A credit card size map and schedule of your show and host city sites, at your attendees’ fingertips. The map conveniently folds and unfolds to a full size map, measuring 13 3/4” x 9”. It fits into most badge holders. Help your guests navigate your show and conference time, while you generate new advertising revenue.